Laura Lee While the 7th Precinct’s National Night Out was disrupted, the 9th Precinct’s event (above) went off without incident. 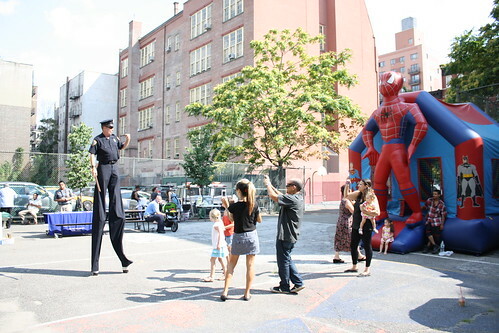 On the Lower East Side last night, a man allegedly armed with a gun ran past crowds and momentarily disrupted the 7th Precinct’s 28th Annual National Night Out, a community event aimed at reducing crime by bringing police and neighbors together. Less than ten minutes into Deputy Inspector Nancy Barry’s opening speech, screams were heard on Attorney Street – around fifteen feet away from where she was speaking. Moments after, people began fleeing past Barry’s stage. The speech broke abruptly. “He had a gun,” said a witness who was standing between Attorney and Stanton Streets when the commotion erupted. Soon after screams were heard, police surrounding Barry’s stage rushed towards the site. A man was seen running past spectators, with three other men chasing after. Two officers detained an unidentified shirtless man, who was held against a wall and patted down. Police at the site declined to comment. A police spokesman declined to comment, and told The Local to follow up in one hour. Update | 7:34 p.m. A police spokesman says that no gun was involved, however seven suspects were arrested for allegedly assaulting a 24-year-old man. The Local East Village has video footage from the scene. Previous post What's The Guggenheim Doing in the East Village?